I am in the process of designing my first n-gauge layout! I am, naturally, quite excited by the prospect! My theme is fluctuating between two competing options right now: a GWR-SR joint line and a Heritage Railway (both fictional, as the lack of appropriate room makes realistic scaling impossible for me ATM). I am very open to advice on this, especially given my novice level knowledge and any thoughts are much appreciated! Below I am going to list the bits and pieces I want to acquire and talk a little bit about my ideas for a track layout. Again, any advice on the items I'm planning on picking up is most welcome. When I ordered my Terrier, I also ordered a pair of Dapol's B Set coaches in GWR shirtbutton livery (6872 & 6873). I know this isn't ideal for a LB&SCR liveried Terrier, which is part of why I'm considering a heritage line (more about this below). I want to have both passenger and freight on my line and I am planning on ordering GWR rolling stock (mostly Peco) soon. Since the major industry I want to have is a brewery, I am going to pick up two of Peco's charming GWR ale wagons, a standard GWR box van, a coal wagon in the butterly steel type, and a GWR Toad brake van (Graham Farish as Peco doesn't seem to make a GWR brake van of any sort). I may also get a cattle car or two eventually, since I plan on having a manor farm by the brewery. I'm located in the US and have a 24"x44" oval of Bachmann EZ-track that came with my first train set (Bachmann's Empire Builder) and the Bachmann DC controller (which I actually hear is very decent as DC controllers go). I will eventually go DCC but that is literally the very bottom thing on my to-do list right now! What is a more pressing concern is that that is a little less than half of the track I estimate that I am going to need and obviously doesn't include any turnouts. Having read a number of poor reviews of the Bachmann EZ-track turnout points and not particularly liking their bedding (the gravel is too light and toy like for my taste), I am considering getting Atlas (code 55) track for my layout and keeping the EZ-track for a test loop. If anyone has some strong opinions here, please voice them! In particular, if anyone has run any of the engines or rolling stock I'm interested in on Atlas Code 55 track, please let me know! Occasionally rolling stock is too low for the track and won't run on it, but in the US I know that is pretty much confined to older rolling stock, so if anyone knows about how new Peco, Dapol and Graham Farish play on Atlas 55, I'd be much obliged. I definitely want to include a bridge and a water feature of some kind, but I have no interest in a tunnel (unless someone can give me a damned good reason to have one). In general, I have found that the Metcalfe kits look great to me online and have most everything I want for my little set-up (plus I am a ROTTEN painter). Right now I am looking at getting: the brewery, goods shed, corner shop & pub, stone platform kit, terrace houses, manor farm, signal box, low-relief bank and shops, village shop & cafe, stone wayside station, engine shed, bridge, low-relief terraced house fronts, and stone cottages. As far as sourcing scenery, I see no reason not to use Woodland Scenics and other scenery easily available in the US, but if someone has had issues with this PLEASE tell me before I go out and get them! As for the actual layout design, I am going to be working a fairly small space (I move into my new apartment in the next week and should have a more exact idea of layout space/possibilities then). Right now I know I have a space that is about 6'x6', which should allow me to make a U or L shaped layout. Ultimately, I want to have three "areas": a town (with station, pub, houses, cafe, etc. ), a railyard (engine shed, sidings, signalbox, etc. ), and an industry (brewery, farm, cottages, water access and a siding with good shed). The idea is that the line will run workers to the brewery with a passenger train in the AM, leave the coaches in the railyard and pick up freight, run freight back and forth between the brewery and the town during the day, and return workers to town at the end of the day. Since I am mostly going to be running GWR rolling stock, but will have at least one non-GWR engine early on (I know one terrier ran the GWR after grouping, but it also ran in GWR livery and had the A1X modifications), I am considering running mine as a GWR-SR joint line but since I have such a variety of locos I want long term, I'm giving serious consideration to the idea of making this into a heritage line where the passenger service is meant to convey tourists to the brewery and the freight line brings ale to the pub in town. This second option seems a bit flimsy to me (freight service on a heritage line doesn't feel quite right, however neat conceptually), but accounts better for the variety in locos I want to have. Thoughts on this are obviously most welcome. I'm not at all sure about the name yet, but deciding on a firmer theme might help with that too! That's about it for now! Many thanks for reading and for any advice you have to give! Welcome aboard! You haven't mentioned anything about possible track plans, but a 6' x 6' area gives you lots of options, especially if you are looking at fairly short trains. It is worth thinking very hard about how you want to operate the layout. A lot depends on how ambitious you are willing to be with gradients, but you can still do a lot even if you choose to keep it all on the flat. Having a continuous run is very desirable, both for testing and to let you just watch the trains go by. It is also a good idea to give your trains somewhere to go to. Many modellers have one station and some sort of storage loops or fiddle yard to represent the "rest of the world", but with that space you can fit in two complete stations instead. A few constraints to keep in mind - best to allow 6" per coach, loco or point/switch; you can do a 180 degree turn in 2' (2'6" is better), so this is fine with an L but might be too tight for a U; keep in mind reaching distance to the back of the layout (2' is about the practical limit). 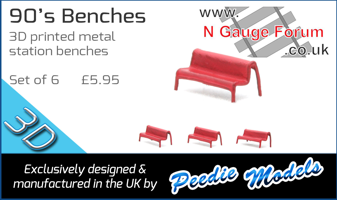 - a U shaped point-to-point layout with the two legs 1' to 1'6" wide - this one can be done on the flat, and allows an unlimited length of run between the terminals. The back straight is an obvious place for a bridge - there is room for quite an impressive strutcture. You could even add a small third station along the bottom of the oval. An advantage of terminal stations is that they need about 2/3rds of the board length of a through station, allowing quite long trains. Thank you so much @martink! I am nervous about doing elevated trackwork but I do think I want to incorporate it to some degree and may want my bridge to run over another line instead of over water, which would make the L-shaped loop you suggested a very good starting point! Thank you also for the tips about spacial considerations. I'm still very much a novice and information like that is incredibly valuable in the planning stage. I have been using Atlas' free track software for plotting basic ideas but am not thrilled with its interface (I do like some of the features and am getting better with it). I have been reading through the forum about track planning software but I'm still not totally sure what other program I should jump to (if any). At any rate, I think I will play around some today and try to create a reasonable version of the L-double loop you've suggested, as I like that idea very much. I've been reticent to tie in a main line, simply because it annoys me that it won't run anywhere (at least presently), but I probably should add that in. Ultimately it isn't very much of a branch line if it doesn't branch off of a main line! Although O gauge look up new chapel junction, I wish I had had the thought for my n gauge layout. Thanks leachsprite4! I gave it a quick search and WOW! Very neat stuff! Imagine what you could do with that same amount of space in n-gauge! The GWR and SR locos look quite natural together on the layout. Definitely a good thing for me to look at! These days, of course, you are correct but back in the 1960s, and before, there were some, including two in Somerset only a few miles apart. The most famous were probably at Selby on the ECML and two between Bristol and Taunton, one at Yatton and another at Highbridge. I'm sure other people will know of similar locations. 1.) It was officially a GWR line but it had lots of SR traffic (and several others pre-grouping! ), as it connects the South Western Main Line with the Great Western Main Line. 2.) Simonds Brewery was located in Reading and bought a number of local breweries after the First World War to expand production. 3.) It had an excellent little branch line (The Coley Branch Line) which will be good for comparing landscape and features, as well as selecting appropriate structures. Ultimately, I will probably have my line be a fictional branch line working off of the Reading to Basingstoke Line, both because I don't want to limit myself to the track configurations of the real lines and because I don't want to have the nightmare scenario of having to match each structure EXACTLY (as I would want to do). So, I want my branch line to connect to a small town (perhaps Beech Hill or Stanford End?) that also has a brewery owned by Simonds in the area south of Reading (I know I have officially wandered out of Oxfordshire by crossing the Thames, but I still have all of the things I wanted for my line!). Is anyone has any special knowledge about this area and can think of anything that would be of interest or a good town to run my branch line to, let me know! I am in the process of moving and so I have been MIA for a while. I finally have my new train space and I'm excited and frustrated by it simultaneously. We have a large walk in closet that I intend to use as my new "train room" and it would be perfect if it were not for a water heater in the corner opposite the door! Were it not for this inconveniently placed necessity of modern living, I would have opted for an L-shaped layout hugging the walls. Since that is not an option, I am building my baseboard to cut out around the water heater, so that I can capitalize on the extant space. This is yielded some interesting layout options, but ultimately I am thinking about something similar to what I have posted below, which is just a quick SCARM mock-up of what it would look like, including baseboard and water heater. The room's dimensions are essentially 100" by 72" and I'm planning on making the baseboard 35" deep in most places. I won't list all the baseboard dimensions here unless someone gets very curious, as you can guesstimate fairly well from the dimensions I've given and the SCARM plan. A town (quite possibly Kingsclere) on the left and in the space between the yard and the station (clearly where the parallel lines are), a few buildings in the yard, and then a farm, brewery, goods shed and some cottages, on the right hand side, as a second village, probably with a small station for a halt (if the town winds up being Kingsclere, this will be Wolverton). Also, a huge thank you to @martink for the suggestion of doing an L-shaped double loop! I've played around with a bunch of shapes and this one seems to work best for the space I have, so many thanks for that! I'm assuming the double track section is to be a station, I would suggest possibly making it a bit longer, say enough to cope with 4 coaches and a loco; also reposition the turnout to the sidings closer to the station, either coming off the curve at the left end of the station, or near or just beyond the bridge to the right of the station, British practice for a small station is usually to have a freight/goods yard adjacent to the station. My assumption may be way off target, what I've assumed to be sidings could actually be a branch line terminus with freight yard, and the double track is just a passing loop. Whatever your intentions, best of luck with the project. I am glad you liked the folded-8 suggestion, and that water heater really limits your options. - make sure that you have enough space around the heater, especially if it radiates heat, and can dismantle things enough to let a plumber get in to work on and even replace the heater. - 35" is probably pushing it for reach. Mine is exactly that width and I can just barely reach well enough to give a loco a nudge but not rerail it or do any work on the layout. This obviously depends on board height, your arm length, etc., but for me it is 18" for full access, 24" for minor jobs, 30" for rerailing and 36" for nudging. For construction and even routine maintenance you really will need to be able get access to the back. - you might want to consider stretching the track out a bit further to the left - even one extra length of straight track will give you a longer loop and sidings, and it is amazing how much of a difference that can make. Thanks Mike! Your assumptions were dead on. The double track is for a station and the section with multiple turnouts is a goods yard. Ultimately, I can add another 6" section to the station with relative ease but moving the yard any closer is quite challenging without having to shorten the station the same 6" I just added in. :/ Ultimately, the distance between the points on the switch leaving the station and the points on the switch entering the goods yard is about 28" which is 345' at 1:148 scale, so it isn't terribly far from the station (about the length of a football pitch), so I don't feel TOO dreadful about the distance, though it isn't quite as nice visually. Thanks again! I'm building the board in modular pieces that can be removed whenever I move out of this apartment and in the event (god forbid) I should have to replace the water heater. I'm not too worried about heat coming off of it (I couldn't detect any and I'm spacing the backboard a few inches from it just in case). As for reach, I am probably going to avoid putting much beyond a backsplash at the back of it (no structures and little scenery on the actual backboard there) and focus mostly on the center and sides for scenery. I am fairly tall and have a good reach and can get most things at 35" fairly well (well enough for this, hopefully) but I have to admit it makes me nervous. How far to extend out on the lefthand side is a big question for me. If I add in another 6" section, I lose a lot of the space I intend to put my town in. On the other hand, this is my primary viewing area and I want plenty of space to see my trains steaming past Right now I've left myself a 10" space on the left hand-side to add in structures because 4"-5" just felt too small. If I'm going to struggle to cover a 10" by 35" area with Metcalfe buildings, then PLEASE let me know! I don't want to end up building a town that has 60 buildings in it! My thought for goods yard access was possibly having the turnout beyond the bridge, or possibly starting the double track before the bridge and having the goods yard turnout immediately after the bridge. If however you have the goods yard turnout to the left of the station then how about a curved point as the last track section before the straight. What track do you intend using, Peco, Kato, Atlas or ? What period will you be running? GWR and SR suggests 1923-1947, possible locations for a small station would probably be in Devon or Cornwall; larger scenarios would be Weymouth, Salisbury or Exeter. The two tended to be bitter rivals dating back into the mid 1800s when it was GWR and LSWR. My layout is set firmly in the 1930s, although my main railway memories date from the 1940s.